Can you believe that Thanksgiving and Christmas are just around the corner?! Wow! It always surprises me how quickly they come each year. Of course, during the year it seems like the holidays are so far away and then suddenly...BAM...it is the holiday season. But I don't mind. In fact, the holiday season starts in September here because Halloween is a big part of our fall. But I never like to forget about Thanksgiving. It is such a wonderful holiday. Since I became a Stay-at-Home-Mom, I've been trying to put together fun crafts and activities to do with the kids, especially during the holidays. It makes the season more memorable and the kids love to create their own projects like this adorable Thanksgiving turkey craft. My goal for this project was to use materials we already had on hand and create something that the kids would love for years to come. A decoration that we could display each fall and they would remember that they made it themselves. Trace your child's hands on the foam or paper. These hands will create the "feathers" for your turkey. My little man really enjoyed this part! Cut out your child's hand prints in several colors of foam or paper. I'd say you'd want at least four and up to 8 hand cut outs. You'll glue the hands together at the palm overlapped and fanned out. Take your fabric scraps and measure every inch and make a small cut. This will help you make sure you have enough strips of fabric. You'll want between 9 and 12 strips. This is the fun part. Your kids will love this. Grab the cut side of the fabric and tear or pull. The fabric will rip right down the line giving it a shabby or "fuzzy" look for your turkey. This was my son's favorite part. You'll want the pieces to be about 4-5 inches long. Pile your fabric scraps together and tie them together with another piece of fabric like the picture above. They don't have to line up perfectly, just enough so they can be tied together. Grab your pipe cleaner. You are going to use this to make the feet on your Thanksgiving turkey craft. Slide your pipe cleaner through the knot you made with your fabric tie and twist it once around the knot. These will be the legs of your turkey. Cut out some little "feet" in your foam or construction paper and glue them to your pipe cleaners. Next, staple your fabric turkey to your foam feathers. This can be a bit challenging for little people, so you may want to take over this part. Glue on some googly eyes and a beak if you'd like to your turkey. 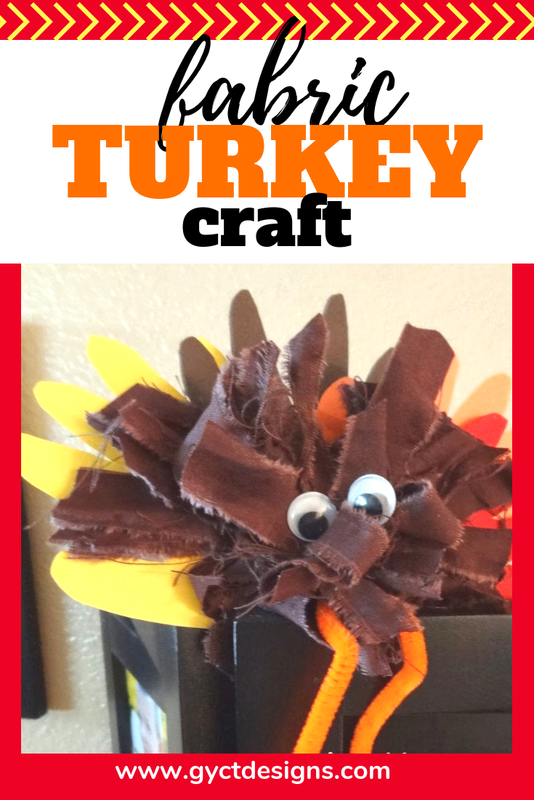 There is your simple fabric Thanksgiving turkey craft. He is super cute and the best part is he'll sit up on his own if you bend his legs. We put him on top of our standing picture frame and the kids love pointing him out all the time. We had a great time with this! Hope you do too!